The globe-trotting Beijing Modern Dance Company will display its talents at Hawaii Theatre this weekend. The Beijing Modern Dance Company brings its high-energy performance to the Hawaii Theatre Friday and Saturday. Founded in December 1995 as an independent company under the leadership of the Beijing Cultural Bureau, the company comprises some of the best dancers and choreographers in China today. Since its inception, it has attracted attention by integrating traditional culture with influences from abroad. The company has attended festivals in the United States, Singapore, Korea and France. It has produced the Chinese Modern Dance Festival since 1999, bringing modern dance companies from around the globe to Beijing. 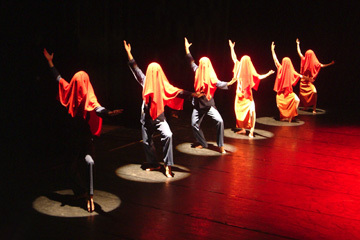 Modern dance is an art form that has been slow to develop in China. The country's first professional troupe was founded less than 15 years ago. Proponents have had to overcome audience resistance, deeply entrenched aesthetic traditions and oppressive government policies. Artistic director Willy Tsao, a modern dance pioneer in China, has been honored with the Bronze Bauhinia Star from the Hong Kong government and the Badge of Honour from Queen Elizabeth II. Tsao holds several public offices related to the development of the arts in Hong Kong. Li Han-Zhong, a graduate of the folk dance department of the Beijing Dance Academy, is the troupe's executive artistic director. Ma Bo, also a folk dance department graduate, is choreographer and a principal dancer.